Paul William "Bear" Bryant (September 11, 1913 – January 26, 1983) was an American college football coach and owner of 323 victories. He was best known as the longtime head coach of the University of Alabama football team, and is the namesake of the Paul W. Bryant Museum. Before Alabama, Bryant was also head coach at the University of Maryland, the University of Kentucky, and Texas A&M University. Bear Bryant was successful as a football coach in large part because he instilled the virtues of self-sacrifice, hard work and teamwork, molding the lives of the young people that he coached. Paul Bryant was the 11th of 12 children born to William Monroe and Ida Kilgore Bryant in Moro Bottom, Arkansas. Three of the twelve children died as infants while Monroe contracted a lethal illness that impelled Bear Bryant's mother to take charge of the farming duties. Growing up on a farm, and surrounded by harsh circumstances and constant sacrifices, Bear knew what it would take to become a winner. The nickname, "Bear," stemmed from his having agreed to wrestle a captive bear during a theater promotion when he was 13 years old. Unfortunately, he never received the one dollar compensation for his endeavors; however, he did have a bitten ear to provide evidence of his ordeal. He attended Fordyce High School in Fordyce, Arkansas, where 6-foot-1 Bryant began playing on the school's football team as an 8th grader. During his senior season, the team, with Bryant playing offensive end and defensive line, won the 1930 Arkansas state football championship. Bryant accepted a scholarship to play for the University of Alabama in 1931. Having left high school before attaining his diploma, Bryant had to enroll in a Tuscaloosa high school to finish during the fall semester while he practiced with the college team. Bryant played end for the Crimson Tide and was a participant on the school's 1934 national championship team. Socially, Bryant pledged Sigma Nu and as a senior, married Mary Harmon, and the two had a daughter, Mae Martin, nine months later. They would later have another child, Paul Jr., in 1944. In 1936, in the first NFL draft, Bryant was selected in the fourth round by the Brooklyn Dodgers, but he did not play for the team. After graduating in 1936, Bryant took a coaching job at Union University in Jackson, Tennessee, but left that position when offered an assistant coaching position at The University of Alabama. Over the next four years, the team compiled a 29-5-3 record. In 1940 he left to become an assistant at Vanderbilt University under Henry Russell Sanders. Following the 1941 season, Bryant was offered the head coaching job at the University of Arkansas; however, following the Attack on Pearl Harbor, Bryant joined the United States Navy. He served in North Africa, seeing no combat action. However his ship, the USS Uruguay was rammed by another vessel and ordered to be abandoned. Bryant, a navy officer, disobeyed the order which resulted in saving the lives of his men. 200 others died. Bryant was granted an honorable discharge to train recruits and coach the football team at North Carolina Navy Pre-Flight. One of the people he coached in the Navy was Otto Graham. While in the Navy, he attained the rank of Lieutenant Commander. In 1945 Bryant accepted the job as head coach at the University of Maryland. In his only season with the Maryland Terrapins, Bryant led the team to a 6-2-1 record. However, there was a struggle for control of the football program between Bryant and Harry Clifton "Curley" Byrd. Byrd was a former Terrapin coach (1912-1934) and, when Bryant was coach, he was the University President. In the most widely publicized example of the power struggle between the two strong-willed men, Bryant suspended a player for violating team rules only to discover that Byrd had the player reinstated while Bryant was away on vacation. Bryant left Maryland to take over the head coaching position at the University of Kentucky. Bryant coached at the University of Kentucky for eight seasons. Under Bryant, Kentucky made its first bowl appearance (1947) and won its first (and only) Southeastern Conference title (1950). The 1950 Kentucky team concluded its season with a victory over Bud Wilkinson's #1 ranked Oklahoma Sooners in the Sugar Bowl, for which many agree that Kentucky deserved a share of the National Championship. The living players were honored for their National Championship during halftime of a game during the 2005 season. Bryant also led Kentucky to appearances in the Great Lakes Bowl, Orange Bowl, and Cotton Bowl. Kentucky's final AP poll rankings under Bryant included #11 in 1949, #7 in 1950 (before defeating #1 Oklahoma in the Sugar Bowl), #15 in 1951, #20 in 1952 and #16 in 1953. The 1950 season was Kentucky's highest rank until it finished #6 in the final 1977 AP poll. After the 1953 season, Bryant signed a 12-year contract extension at Kentucky, with hopes of making football the school's primary sport. Within weeks, however, he realized popular basketball coach Adolph Rupp was also ready to receive an extension. "Bryant had earlier been told by the school's president that Rupp would be fired for rules violations. Feeling as if he had been duped, Bryant quit." In 1954 Bryant accepted the head coaching job at Texas A&M University for a sum of 25,000 dollars over six years. He also served as athletic director while at A&M. Bryant wasted no time bringing a winning mentality onto the squad. The Aggies suffered through a grueling 1-9 initial season which began with the infamous training camp in Junction, Texas. This was a training camp which was conducted in 100 degree heat, and saw only 35 of the initial 111 players remain on the team. The “survivors” were given the name “Junction Boys.” Two years later, possibly a result of the Junction experience, Bryant led the team to the Southwest Conference championship with a 34-21 victory over the University of Texas at Austin. The following year, 1957, Bryant's star back John David Crow won the Heisman Trophy (the only Bryant player to ever earn that award), and the Aggies were in title contention until they lost to the #20 Rice Owls in Houston, Texas, amid rumors that Alabama would be going after Bryant. At the close of the 1957 season, having compiled an overall 25-14-2 record at Texas A&M, Bryant returned to Tuscaloosa to take the head coaching position, as well as the athletic director job at Alabama. Statue of Bryant outside of Bryant-Denny Stadium. Bryant took over the Alabama football team in 1958. When asked why he came to Alabama, he replied "Momma called. And when Momma calls, you listen." After winning a combined four games the previous three years, the Tide went 5-4-1 in Bryant's first season. The next year, in 1959, Alabama beat Auburn and appeared in a bowl game, the first time either had happened in the previous six years. In 1961, Alabama went 11-0 and defeated Arkansas in the Sugar Bowl to claim the national championship. The next three years (1962-1964) featured Joe Namath at quarterback and were among Bryant's finest. The 1962 season ended with a victory in the Orange Bowl over Bud Wilkinson's University of Oklahoma Sooners. The following year ended with a victory in the 1963 Sugar Bowl. In 1964, the Tide won another national championship but lost to the University of Texas in the Orange Bowl in the first nationally televised college game in color. The Crimson Tide would repeat as champions in 1965 after defeating Nebraska in the Orange Bowl. Coming off of back-to-back national championship seasons, Bryant's Alabama team went undefeated in 1966 and defeated a strong Nebraska team 34-7 in the Sugar Bowl. However, Alabama finished third in the nation in the polls, behind Michigan State and Notre Dame. The 1967 team was billed as another national championship contender with star quarterback Kenny Stabler returning, but the team stumbled out of the gate and tied Florida State 37-37 at Legion Field. The season never took off from there, with the Bryant-led Alabama team finishing 8-2-1, losing in the Cotton Bowl to Texas A&M, coached by former Bryant player and assistant coach Gene Stallings. In 1968, Bryant again could not match his previous successes, as the team went 8-3, losing to Missouri 35-10 in the Gator Bowl. The 1969 and 1970 teams finished 6-5 and 6-5-1 respectively. In 1971, Bryant installed the wishbone offense. That change helped make the remainder of the decade a successful one for the Crimson Tide. That season Alabama went undefeated and earned a #2 ranking, but lost to #1 Nebraska, 38-6 in the Orange Bowl. The team would go on to win national championships in 1973 (which led the UPI to stop giving National Championships until after all the games for the season had been played—including bowl games), 1978 and 1979. Bryant coached at Alabama for 25 years, winning six national titles (1961, 1964, 1965, 1973, 1978, and 1979) and thirteen SEC championships. Bryant's win over in-state rival Auburn University, coached by former Bryant assistant Pat Dye in November 1981 was Bryant's 315th as a head coach, which was the most of any head coach at that time, eclipsing the record of Pop Warner. Many of the Bryant-coached players and assistant coaches went on to successful football playing and coaching careers. Bryant died on January 26, 1983, at age 69 after checking into Druid City Hospital in Tuscaloosa with chest pains. His death came 28 days after his last game as a coach. He is interred at Elmwood Cemetery in Birmingham, Alabama. He was buried with his most cherished possession, the Junction Boys ring he was given in the reunion with his former Texas A&M players. Three-time National Coach of the Year in 1961, 1971 and 1973. 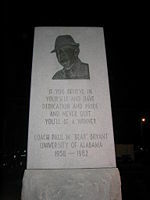 The national coach of the year award was subsequently named the Paul "Bear" Bryant Award in his honor. Was named Head Coach of Sports Illustrated's NCAA Football All-Century Team. In February 1983 President Ronald Reagan awarded him the Presidential Medal of Freedom. Bryant was honored with a U.S. postage stamp in 1996. Alabama's Bryant-Denny Stadium was named for him in 1975 as well as a high school and a major street that runs through the University of Alabama campus in Tuscaloosa, Alabama. Country singer Roger Hallmark recorded a tribute song in his honor. Many of Bryant's former players and assistant coaches went on to become head coaches at the collegiate level and in the National Football League. However, Bear Bryant will always be remembered for being a winner, not only in the game of football, but life itself. His rigorous programs often earned him the ire of many, but it also made his players stronger mentally. Bryant's most famous quote, "I don't want ordinary people. I want people who are willing to sacrifice and do without a lot of those things ordinary students get to do. That's what it takes to win." The Paul W. Bryant Museum is dedicated in the honor of Bryant. Bryant's legacy rests in his record: 38 years of coaching with extended tenures at Maryland, Kentucky, Texas A&M and Alabama and a 323-85-17 (.780). He took 29 teams to bowl games and led 15 to conference championships. In the 1960s and 1970s, no school won more games than Alabama (193-32-5). Simply put, in the words of former Nebraska coach Bob Devaney, "He was simply the best there ever was." ↑ 1.0 1.1 1.2 1.3 Allen Barra, The Last Coach: The Life of Paul "Bear" Bryant (W.W. Norton & Company, 2005). ↑ 2.0 2.1 2.2 2.3 2.4 2.5 2.6 2.7 Bear Bryant 'simply the best there ever was'. ESPN (3-21-07). ↑ Ivan Maisel, August 16, 1999, SI's NCAA Football All-Century Team Sports Illustrated. Retrieved December 22, 2007. ↑ Bear Bryant Retrieved December 22, 2007. Coach Bryant Timeline at the Paul W. Bryant Museum. Retrieved April 17, 2008. Paul "Bear" Bryant at the College Football Hall of Fame. Retrieved April 17, 2008. Bear Bryant quotes Wikiquote. Retrieved December 22, 2007. This page was last modified on 24 May 2016, at 16:40.